US prepared for "Sudden Change" in North Korea since 2009. December 19, 2011 - The Council on Foreign Relations, a corporate-financier funded think-tank that represents the collective interests and agenda of Wall Street and London, had in 2009 published an extensive, 52 page report titled, "Preparing for Sudden Change in North Korea." 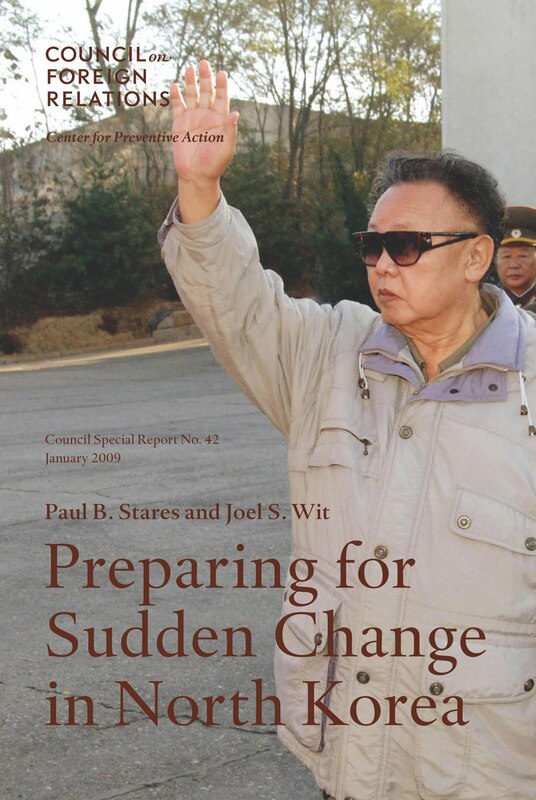 The report covered "Scenarios for Change in North Korea" and included "managed," "contested," and "failed successions." The report makes no secret of US foreign policy toward North Korea and the desire to see the nation "integrated" with the South, a nation whose political system has long been co-opted by the United States, kept a watchful eye on by USPACOM's regional presence, and only saved by the nationalism of the South Korean people themselves. On page 36 of the report, it is stated that chaos within a "changing" North Korea would raise concerns including, "maintaining security and stability in the North, locating and securing Pyongyang’s weapons of mass destruction, dealing with potentially serious humanitarian problems such as large-scale refugee flows or starvation, managing the political and legal issues relating to the formation of a transitional government, and addressing the economic challenges posed by the demise of the North and its possible integration with the South." Of course, these are "concerns" the "international order" led by Wall Street and London would deal with, not the people actually living on the Korean Peninsula. And to address these concerns the report actually suggests deploying 115,000 to 230,000 foreign troops along with tens of thousands of "police" to support them in establishing "security and stability." On the rebuilding of North Korea's economy, the report feverishly preaches market liberalization, privatization, and integration with South Korea who is currently on the verge of entering into expansive "free trade" with the United States. In the case of "reunification," the United States will have just doubled the market its parasitic corporate-financier interests were already preparing to despoil. Recommendations for US policy are made, beginning on page 44, and include the suggestion that the US continue promoting "behavioral change within the current regime rather than actively seek to overthrow it," that is ... "unless extreme circumstances dictate otherwise." The report also suggests that working closely with the European Union, who has diplomatic representation in North Korea, will help the US understand better, any sign of coming "sudden change" to refine the regime of exploitation outlined in the CFR report. Other schemes of re-approaching North Korea are discussed, such as using the excuse of recovering the remains of missing American soldiers lost during the Korean War to improve contacts and provide useful information on unfolding events within North Korea (page 46 & 47). A "common vision" between the US and South Korea for a reunified Korea is also discussed at length as are the military, economic, and social preparations that would be necessary to carry out this "vision." Such a common vision begs one to wonder what say the United States, separated by an entire ocean from Korea, actually has in the future of the Korean people. The preparation of a NATO-style military alliance referred to as a "regional security cooperation in northeast Asia" is also recommended to help in "legitimating" the West's attempts to exploit and fill the void created in a possible collapse of North Korean society. The thought of a reunified Korea, militarily occupied by the United States and its collective economy opened to unmitigated exploitation via the pending US-FTA must alarm Beijing to a certain degree, especially with the recently unveiled "American Pacific Century" policy that enumerates a strategy of encircling and containing China's tactical and economic rise while maintaining a century of American hegemony over Asia. And surely it must North Koreans that the United States has prepared their future and destiny in such minute detail and are prepared to lead North Korea's transformation, at the barrel of a gun if need be. It should be noted that North Korea's unraveling, and the door it would open to a reunified Korea under American military and economic occupation needs not necessarily be organic. The United States is on record training North Korean activists to sow "Arab Spring-style" chaos just as it has throughout the Middle East. In Foreign Policy's article "Revolution U," where the story of US-funded CANVAS is told, North Korean activists are mentioned several times as recipients of the same US-funded training offered by CANVAS and used by activists to help overthrow the governments of Tunisia, Libya, and Egypt. With a heavy US military presence just over the border, and with several suspicious provocations already attributed to the US presence on the peninsula, all the ingredients are available to coax North Korea's destabilization along and justify the execution of CFR's 2009 machinations. Whether they exist there in the right measurements or will find a well prepared, Chinese-backed North Korea ready to balk them instead remains a question only time will tell.